The 12 gauge has been around for over a century in its modern form, but it has not fallen out of use in the slightest. It is still one of the most popular firearms for close range hunting, sport shooting, self defense, military, and law enforcement applications. 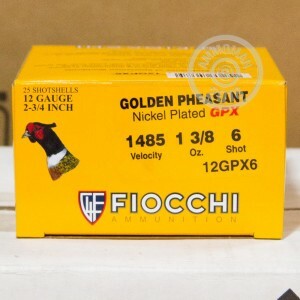 Whatever ammo you need, Fiocchi offers a high quality option. 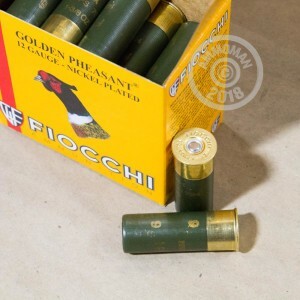 As the oldest ammunition manufacturer in Italy and still owned by the founding family, Fiocchi makes some of the best ammo in the world. 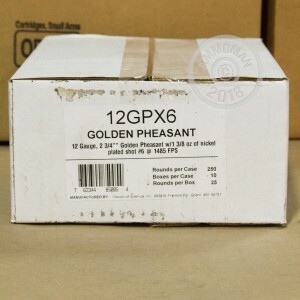 These Golden Pheasant shells feature nickel plated #6 shot for improved accuracy and reduced pellet deformation. Each hull measures 2-3/4" in length and exhibits the accuracy and efficacy you need to knock those birds out of the sky.